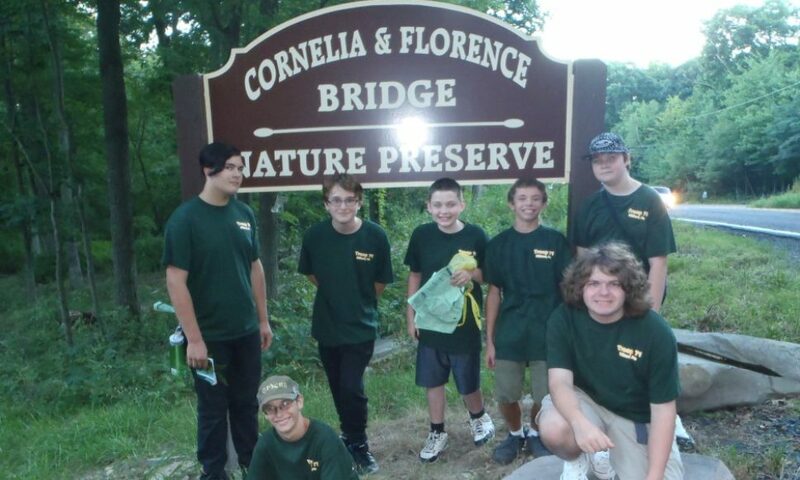 Boy Scout Troop #71 assisted Pike County Conservation District’s Watershed Specialist Emily Rinaldi with tree and shrub identification on September 1 at the Cornelia & Florence Bridge Nature Preserve on Twin Lakes Road. The results of the Scouts field work will be used as part of Dingman Township’s effort to install interpretive signs along the trails at the Preserve. The interpretive signs will include tree, shrub and wild flower identification, along with facts on rain gardens and other habitats found throughout the trail system. This project is being partially funded with a PA Department of Environmental Protection Environmental Education Grant that was awarded to Dingman Township.